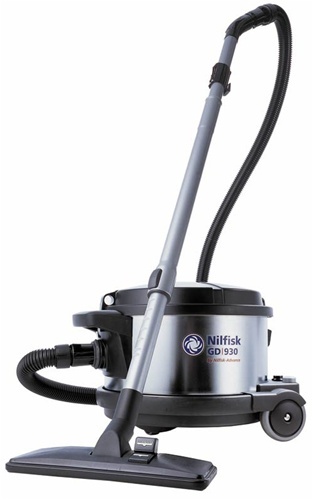 The GD 930 is a durable, GREEN LABEL CERTIFIED canister vacuum cleaner that combines reliability and outstanding performance at a low price. It is ideal for cleaning houses, hotels, offices. Designed for industrial-strength cleaning and durability in the home or commercial setting, it features powerful suction and excellent manueverability. Its compact size and lightweight design make it easy to use and store. A superior 3 stage fully sealed filtration system captures particles within the vacuum, so they are not spit back into the air. The vacuum is fully gasketed and sealed so that the air drawn into the machine is expelled through the filter before being exhausted. It can be upgraded to HEPA filtration by purchasing a HEPA filter (sold separately). Vacuum with 1000 Watt Motor Includes: 6' Hose Assembly with Bent Wand, Telescopic Wand, Combination Floor Nozzle, Crevice Tool, Combination Round Dust Brush/Upholstery Tool, and one paper bag. An optional air-driven beater bar (spinning brush nozzle) or motorize beater bar nozzle are available for use on shag carpets. Dimensions 17.5" x 15" x 13"